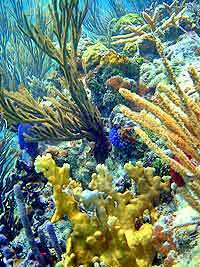 In the bayside paradise of Akumal Mexico, just 10 minutes south of Playa del Carmen, lie the amazing natural coral reefs of Yal-Ku Lagoon. Perhaps the best shore snorkeling in the entire Riviera Maya, including Cancun, Yal-Ku teems with life. The water conditions are almost always calm, making this a wonderful snorkeling location for beginners and families as well. The water is the perfect depth for snorkeling, between 6 and 15 feet deep, which lets the light through to bring out the brilliant colors. Look out for sea turtles, rays and tropical fish while snorkeling at Yal-Ku Lagoon in Akumal! Discover marine life of all kinds, including stingrays, barracudas, parrot fish and an assortment of other interesting sea creatures! Where: Tour Offices in Downtown Playa del Carmen. Detailed directions will accompany your confirmation. Hotel Pick-up and Drop-off is available upon request for an extra charge. Extra cash for drinks, tips, lunch, equipment rental, etc. Note: Only biodegradable, chemical free sunscreen is allowed at Yal-Ku Lagoon. Cruise Passengers: This is a great idea for a cruise shore excursion. The meeting point is only a short walk from the Cozumel ferry pier or a 10 minute taxi ride from the Calica cruise pier.